A week or so ago I was browsing /r/Python and I saw a link to a website called rise4fun.com, which is a Microsoft Research project that contains a lot of cool demos and tools that you can run in your browser. The demo I was linked to was a restricted Python shell that could be used to experiment with a “high performance theorem prover” called Z3. Python is a highly dynamic language and so it is pretty hard to secure correctly, and I found numerous ways around the restrictions they put in place which I have detailed in this post. Due to these issues the z3py section was removed shortly after I made contact so you can’t see it for yourself, however the plain z3 section is still there so take a look here for reference (just imagine it took Python code as input). They implemented these restrictions by parsing the Python code into an AST representation and looking for any attribute access prefixed with a double underscore, any use of the import statement or any name in a blacklist. This works in most cases as almost all exceptions have Exception as a parent somewhere. However there are a few (MemoryError for one) that inherit only from BaseException and not Exception, and so would not get caught by that code. 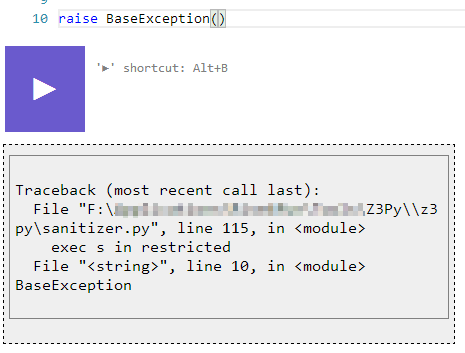 Raising a BaseException() escaped the try/except block they had in place and gave me a nice traceback with some the path to the executing script. By enumerating the attributes I found an interesting one called “ctx”. This wasn’t interesting by itself, but it had an attribute called “lib” that was a reference to the z3 module, which had some interesting sounding functions. Python is hard to secure. The best way is to execute it in a temporary environment (like a temporary docker instance) so that if someone did manage to escape they would not be able to wreak havoc on anything important. That being said the blacklist AST parsing method that rise4fun used was clever and worked to a degree, improvements could be made to make it more viable.